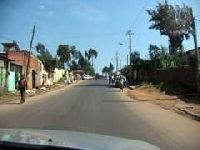 This hilly area northwest of Arada has seen a recent influx of middle-income Ethiopians attracted by the combination of space and proximity to the city centre. However, it remains true to its original identity as a low-income area supporting a small cluster of light industries along the road leading northwest out of the city; and here, as in many other parts of Addis Ababa, the poor and less poor live cheek-by-jowl. Basic foods can be bought easily and cheaply throughout the area; there is also a regular fresh produce market and a market selling second-hand clothes. Sheger Park, on the busy road running southeast into Arada, can be hired for wedding receptions, graduation ceremonies and other important functions. Just to the south of the park, there is a crafts market on Wednesday and Saturday mornings. The Greek, Italian and Addis Ababa Commonwealth War Graves cemeteries and the General Wingate School, named after the British general who played a key role in Ethiopias liberation in 1941 and which counts incumbent prime minister Meles Zenawi among its alumnae, are also located in this area.